A wonderful combination of chewable, shredding fun awaits your feathered friend with the Cork Petals toy. 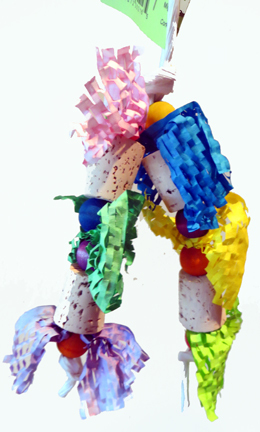 Strung on paper rope, with a simple loop on top for easy hanging, there are layers of bright, colorful waffle paper and chunky, chewable 1.25" corks with colorful, wooden balls for added beak pleasing delight. Definitely a good choice for the smaller to mid sized parrots in your life. !